I’ve been in Taiwan nearly a week. My friend Sandra and I left Istanbul at midnight Friday, arriving in Hong Kong about 9 hours later. 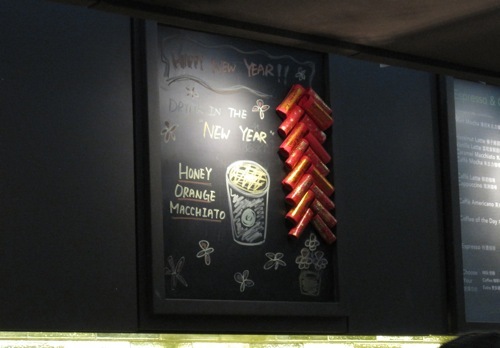 We were impressed by their lavish Chinese New Year decorations—mostly gold and red. After posing with the brilliant displays, we tried to cash in our “refund” for the departure tax, which we’d learned was refundable for people arriving and departing Hong Kong on the same day. That would be us. I’d jotted 7th level, row D, but of course the desk wasn’t there. In spite of the New Year’s crowds, we forged on, asking people until we found it. The lady at the desk said we didn’t have the right papers, and to go to the ticketing desk for a new receipt. Thanks to Sandra’s perseverance, we found that desk (no line, thank goodness), had her print up new receipts for us, and trekked back to the first desk. The woman nodded when she saw us, made multiple copies of our receipts, our passports, and our boarding passes for both flights, highlighted important information, and filled out yet another form. Really! It took her well over ten minutes, but in the end we each got 120 Hong Kong Dollars (about $15). It must have cost the airport authorities far more to process it, but the Starbuck’s frappucino tasted GREAT! We arrived at our hotel in Taipei around midnight Saturday night (after 18 hours traveling), and amazingly found our way on public transport to our hotel. We collapsed into our lush room at the Hansome (Han-She) Hotel. 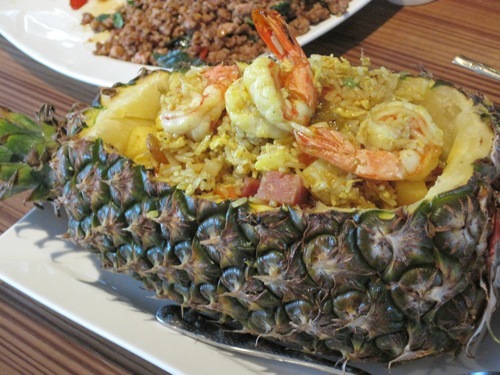 and barely woke in time to catch breakfast, which was pretty Chinese (lots of indescribable dishes). We managed scrambled eggs, peanuts, sesame-covered dried/sweetened carrots, and who-knows-what-else. Thankfully, they had an espresso machine. 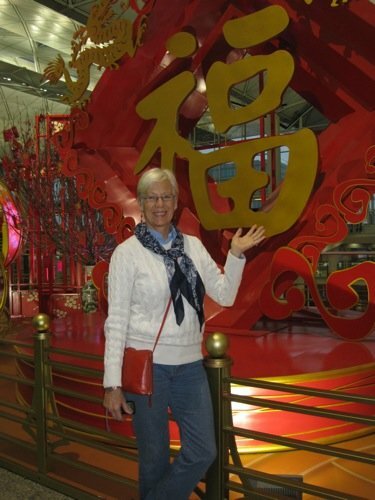 We headed off with Linda Kuiken (our friend teaching in Taiwan) for the National Palace Museum. 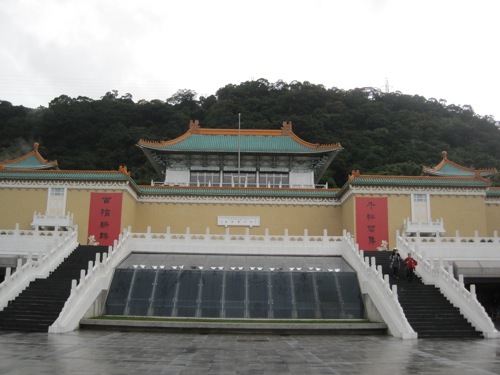 Between the first and second world wars, many of China’s finest treasures were removed from the Forbidden City Palace (Beijing) and brought to Taiwan for safekeeping, and now nearly a third of China’s great art and artifacts are housed in this museum. It also got us out of the drizzle. Actually, there has never been a palace in Taiwan, so the name is a misnomer. Next we headed for the harbor, but the rain drove us into a Starbuck’s (only Western businesses were open—everything was closed for the Chinese New Year). We ended up wandering a bit and discovered a few temples and shrines, then strolled down a narrow street where vendors sold street food. 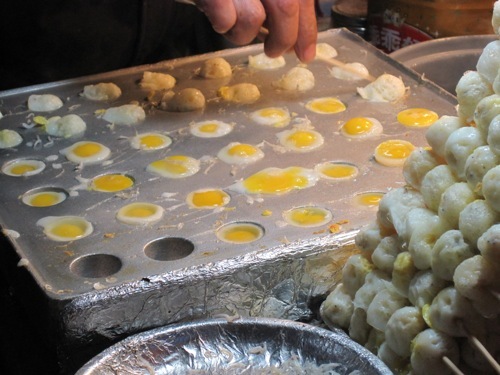 My favorite was the cooked quail egg shish-ka-bob slathered with soy sauce. We also watched people burn fake money in little buckets to honor their ancestors. On the way back to our hotel we came to the frightening realization that the restaurants were all closed. We wandered the deserted, rainy streets hoping to find something edible and ended up dining at KFC. 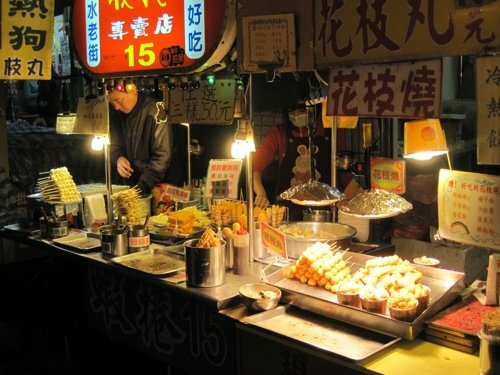 “I travel 1200 miles to Taiwan for the Chinese New Year, and I end up eating KFC chicken, for cripes sakes!” Sandra moaned. Well, it was food, and we were starved. The highlight of our first day in Taipei was the lantern festival at Longshan Temple. 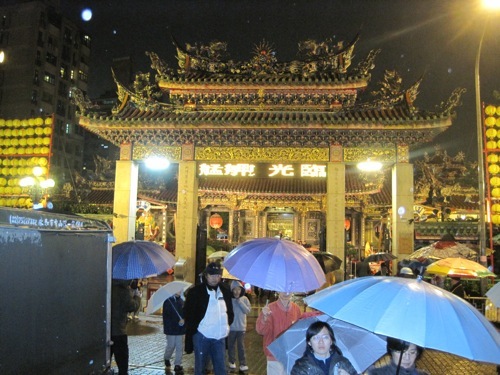 Although it was still drizzling, hundreds of people gathered to pray, chant, sing, and honor their ancestors at this ancient temple, probably the most famous in Taipei. 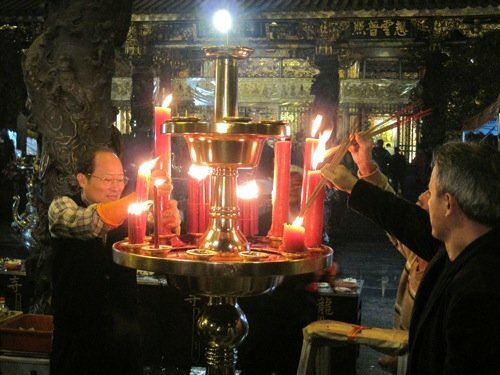 As we snapped photo after photo, people lit candles and incense, nodding and praying as a monk led their worship. 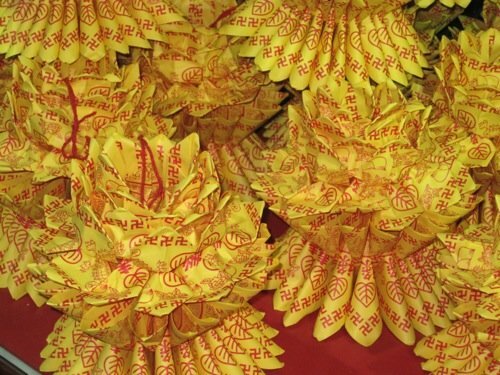 The temple was not only filled with people, but also with offerings of food and flowers—everywhere. 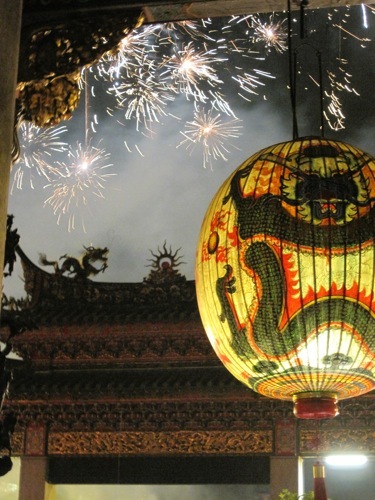 As we watched in fascination, a huge fireworks display was set off just outside the front gate of the temple. It was all amazing. Then afterwards officials paraded through displays of lit-up models of the animals that represent each of the 12 years of the Chinese zodiac. 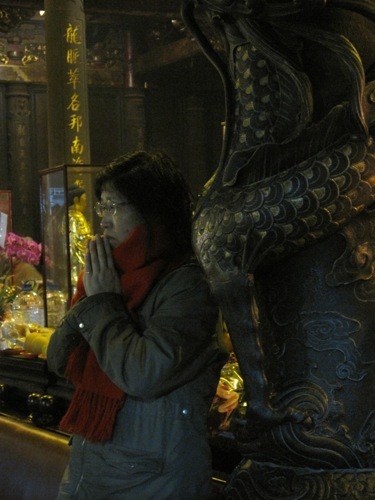 The largest, of course, was the dragon, as 2012 is the Year of the Dragon. 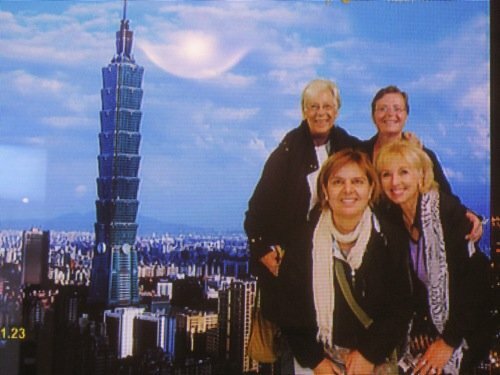 On Monday we gathered early to trek to Taipei 101, the world’s second tallest building. Luckily, it was one of the few things open, since it was the actual Chinese New Year’s Day. We rode the fastest elevator in the world up 89 floors, as the observation deck was closed due to weather. It took 37 seconds. 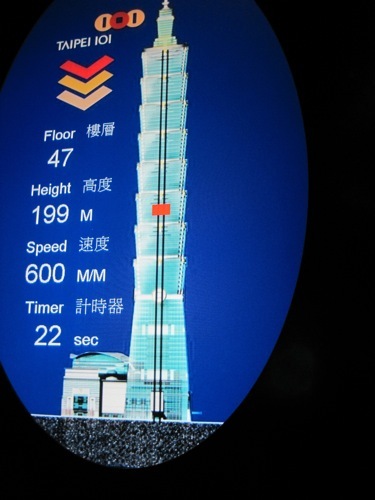 The elevator can go over 1000 meters per minute, and it’s a smooth ride—a real ear-popper, though. We could only see in one direction, as much of the city was blanketed in fog. Sigh… It was fun anyway. After a delicious Thai lunch (we still hadn’t had a Taiwanese meal) we headed off to take a gondola to see the city from a mountaintop. The wait was only a half hour because the weather was so bad (and clouds would hamper the views). The ride was gorgeous, though, and we could see fingers of the city poking between the mountains. We found a very traditional tea house for our obligatory cup of tea, and the waitress gestured for us to walk across a little pond, hopping from stone to stone, to enter the eating area. 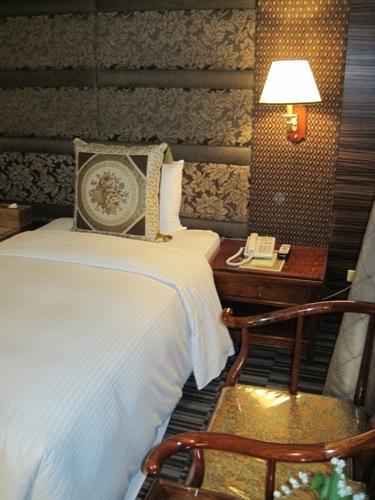 She showed us into a small, ornately-furnished room with a low table and silk cushions. We settled in with as little bone-creaking as possible, then puzzled over what to do next. Oops! Shoes… We snuck them off and set them on the steps leading into our room. The waitress returned with a wooden tray of snacks (probably expensive), and told us there was a surcharge of $150 each (about $4.50 American), which we assumed was for the cushions. 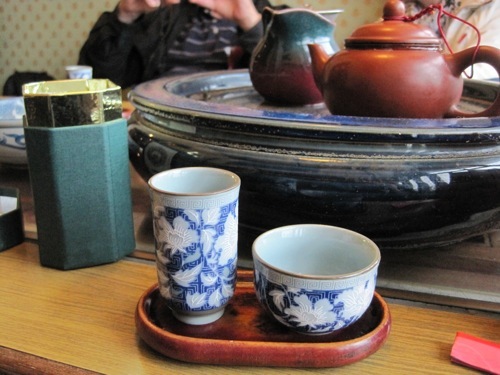 Tea would cost an additional $350 for the five of us, and we chose Oolong. None of us really knew just how to brew the tea, but we figured that we should put loose tea into the pot, then pour water over it. I remembered that Mayu taught me to pour off the first water, so we did that. Then Janna poured water over the tea and we let it steep a while as we chatted and enjoyed the stunning mountaintop view. We strained the tea into a pitcher, then poured it into the taller of the two cups we were each given. From there we poured it into a small cup and took a sip. It tasted like silage. Wet silage. Hysterics abounded. We each choked down a few cups of the tea, agreeing that it was all about the experience more than the taste. 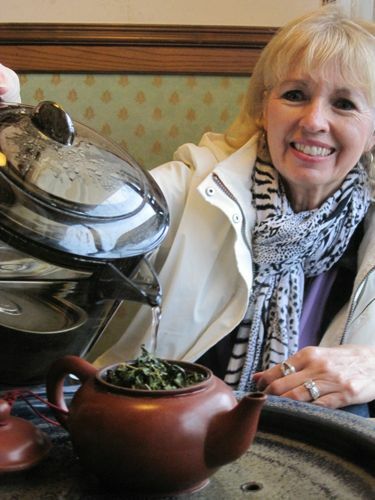 We brought our leftover Oolong back for Sandra, who didn’t make it to the top of the mountain. 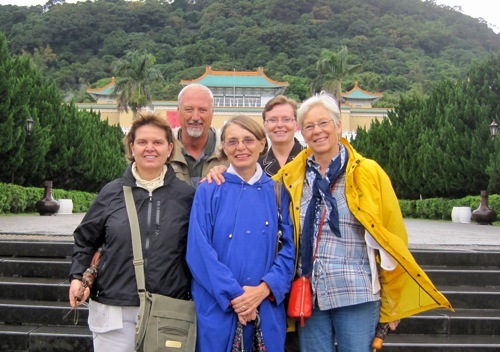 Tuesday we basked in hot springs, then hopped the evening high-speed train to Kaohsiung, where Linda and Les live at the south end of Taiwan. Oh, such larks!